Learn all about the details of the available Trigger Types! Time on Site - Set how much time a customer should spend on your site to see a discount popup. Fill in the "Trigger Value" field with the amount of time. Time on Any Product Page - Set how much time a customer should stay on any product page to see a discount popup. Fill in the "Trigger Value" field with the amount of time. Time on Product Page from a Specific Collection - Set how much time a customer should stay on a product page from a particular collection to see a discount popup. Choose the collection from the "Existing Collections" drop-down list, then fill in the “Trigger Value” field with the amount of time. Time on Product Page with a Specific Vendor - Set how much time a customer should stay on a product page of a particular vendor to see a discount popup. Choose a vendor from the "Existing Vendors" drop-down list, then fill in the “Trigger Value” field with the amount of time. Time on Product Page with a Specific Type - Set how much time a customer should stay on a product page of a particular type to see a discount popup. Choose type from "Existing Types" drop-down list, then fill in the “Trigger Value” field with the amount of time. Time on Product Page with a Specific Tag - Set how much time a customer should stay on product page with particular tag to see a discount popup. Choose tag from the "Existing Tags" drop-down list, then fill in the “Trigger Value” field with the amount of time. Time on Specific Product Page(s) - Set how much time a customer should stay on a product page from selected specific products to see a discount popup. 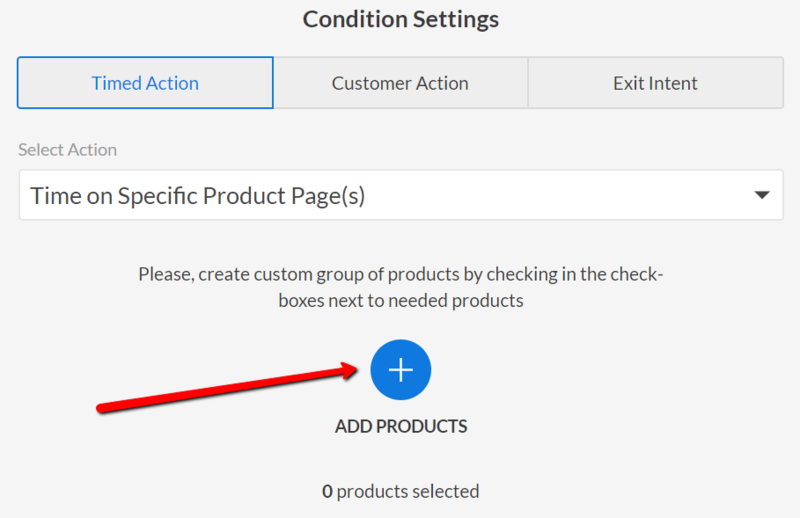 Click the "Add Products" button and create a custom group of products by checking the check boxes next to the desired products. Then fill in the “Trigger Value” field with the amount of time. Entry Popup - Choose this type to immediately show a discount popup for every customer who visits your site. View (x) Pages of Store - Fill in the "Trigger Value" field with the number of pages a customer should visit to trigger the discount popup. View (x) Product Pages from a Specific Collection - Choose the collection from the "Existing Collections" drop-down list and then enter a number of products into the "Customer should view" field to determine how many products from this particular collection a customer should view to trigger a discount popup. View (x) Product Pages with a Specific Vendor - Choose a vendor from the "Existing Vendors" drop-down list and then enter a number of products into the "Customer should view" field to determine how many products of this particular vendor a customer should view to trigger a discount popup. View (x) Product Pages with a Specific Type - Choose a type of product from the "Existing Types" drop-down list and enter a number of products into the "Customer should view" field to determine how many products of this particular type a customer should view to trigger a discount popup. 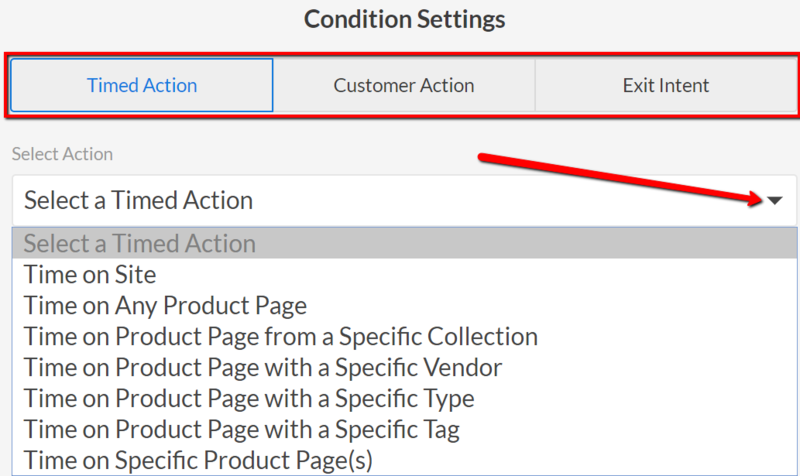 View (x) Product Pages with a Specific Tag - Choose a tag from the "Existing Tags" drop-down and enter a number of products into the "Customer should view" field to determine how many products with this particular tag a customer should view to trigger a discount popup. 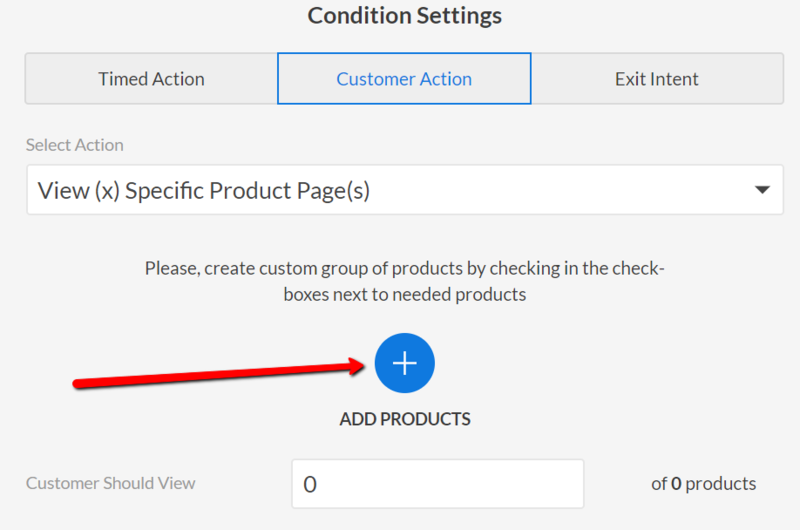 View (x) Specific Product Page(s) - Click the "Add Products" button and create a custom group of products by checking the check boxes next to the desired products. Then enter the number of products into the "Customer should view" field to determine how many of them a customer should view to trigger a discount popup. Exit Intent - Choose this type to show the popup on a desktop/laptop computer when a visitor performs behavior with their mouse/cursor that indicates they are navigating away from or closing your store page. Note: Exit Intent works on Desktop/Laptop computers only. Also, if you create two "Exit Intent" triggers, the one that was created most recently will be shown first to your visitors. When closed and triggered a second time, the second (older created) exit intent trigger and popup will show. Available only when the Time on Site and View (x) Pages of Store condition types are selected. This is an optional setting. If you want the trigger to be activated on all pages on your store, don’t check the box to Exclude “Cart” or Exclude "Products" and don’t add new page URLs. If you don’t want a trigger to be activated on certain pages of your site, add the page’s URL in Exclude Specific URL field and click the Exclude button. All added URL’s will be shown below the Exclude Specific URL field. Regular Expressions (RegEx) also work in the "Exclude" field. To remove an excluded URL, click the "X" near the URL to remove it.